When crafting a new policy on consignments, it occurred to us that a full blog on consignments and trades would be a help to guide our customers through the process. Too many drum and music shops deal without clear guidelines and sometimes with little integrity. Our goal at TCDC is to make consignments and trades a fair, efficient, and satisfying experience for our customers. With this in mind, this blog contains realities about parting with your drums and cymbals to be transparent and to ensure that we share expectations, leading to everyone being satisfied with the outcome. Let’s begin with some truisms. Many people overvalue their used equipment, and it is easy to see why: We love our drums and cymbals! Making music is personal, and it’s hard to separate our emotions from our gear. We get it, though at the end of the day, market value reigns supreme. Like selling a house, anything on the market too long loses its luster, and it does not benefit you to wait for months or longer to move your drums or cymbals. The second obvious reason for overvaluing is that people want to get back as much as they can back from an investment. That is an understandable desire. However, the reality is that most drums and cymbals do not gain value, and most are expected to go down, often significantly, in value. Low- and high-end kits on the secondary market suffer the most here. Low end drum sets have a lot of brand-new low-end competition, and most people won’t buy a used set to save only a couple hundred dollars, especially since parents prefer to bring home something shiny and new to motivate their son or daughter, unless money is a serious priority. On the high end, drums above a couple thousand dollars face a particular bias too. If you had several thousands of dollars to spend, then why not splurge on the new drums of your dreams instead of a used drumkit? Of course, there are exceptions to this rule. Some high-end drums, even with higher prices, can be a true value for the buyer. This is especially true with desirable vintage, elite, and hard to find drums. So, it is helpful to check expectations anytime you want to part ways with drums and cymbals. Fortunately, in the internet age, it is easy to check Reverb and EBAY or other online sources to see what gear similar to yours is priced at. Chances are your drums and cymbals will not demand more, and we encourage you to research to be informed. This information is the friend of both of us. Once you have done the research, and you have decided to sell, it’s important for you to know that your (hopefully) favorite drum shop needs to turn a profit on buying, trading, and consigning. It’s somewhat embarrassing to even acknowledge that this happens, but some people forget that the drum shops are not charities! The shop that hosts the sale pays rent per square foot (a stacked drumset takes up four of them), utilities, advertising, insurance, and for the employees who will happily talk with anyone and everyone who wants to kick the tires on your drums. If selling your gear was easy, then why bring it into the shop? Do you want to talk to all those people, vet buyers, handle transactions, and in some cases pack and ship? Exactly! So selling your gear has to work for the shop too. To that point, gear that the shop buys or trades requires a purchase or trade of 40% below an expected sale price although we reserve the option of offering less if the equipment is in poor condition or not likely to move based on other circumstances described below. When we buy our goal is to have an expectation of selling it in a reasonable period of time, under six months to be sure. Having stock that turns over slowly is a recipe for failure in a retail business of any type, so drum shops cannot offer top-dollar for drums that are likely to sit. With lower quality and with less desirable drums and cymbals our consignment rate by necessity needs to account for the added time, effort, and cost needed to sell those instruments. Some equipment is not desirable, and our shop does not want to be known for being the land of the misfit toys. Frankly, there are other music stores that don’t mind warehousing the undesirables for as long as it takes, and with items that are of low quality and/or in poor condition, we are likely to take pass unless they are priced to move with a suitable consignment rate. Mint: Brand new condition (e.g., new old stock or rarely played and carefully stored) 15% Consignment Rate. Excellent: Looks almost new and shows only slight use. 20% Consignment Rate. Very Good: Shows light wear that is less than what is expected given its age. 20% Consignment Rate. Good: Shows a little more wear than what is expected given its age. Or, is in above good shape but with a well-done repair or alteration. 25% Consignment Rate. Fair: Still in decent condition but shows more than normal wear. Or, is in above fair shape but with a poorly done repair or alteration. 30% Consignment Rate. Poor: Barely useable condition. 40% Consignment Rate. The next factor is desirability. Standard sizes and configurations with popular finishes remain ever popular and desirable. Deviations in these factors make a sale harder. T.S. Elliot once wrote, “The more you please generally, the less you please profoundly.” Well said, though when you are trying to sell pleasing generally enough is the name to the game. Of course, there are exceptions that can make a drum or set ultra-cool and desirable, but most everyone will recognize and agree when that is the situation. And last, although trends come and go, some factors currently lack popularity, and those factors may never be popular again. Unpopular factors include power toms, ultra-deep bass drums, super-heavy hardware, and hanging floor toms. And hanging floor toms. The Cosby Show was once a hit and will never be again. Hanging floor toms were never the Cosby Show, and as innocent as hanging floor toms are, they are never coming back either. It is time to move on with grace and lower the price. For drums that have factors that limit the desirability of them, we add 5% to the consignment rate assigned to the condition levels. At the end of the day, selling your drums and cymbals is like selling a home. Having a property sit on the market for a long period of time benefits no one, and the longer properties sit the more their value drops. At TCDC our commitment is to you receiving top dollar for your drums and cymbals. To that end, we let you know what your drums and cymbals are realistically worth, and we will do our utmost to sell them on a timely basis, including listing them on internet marketplaces. We also guarantee that you will be treated fairly, because that is what our reputation rests on (and we happen to be good people too). And we pay you at the time we collect the funds for the sale, which again, is about integrity. 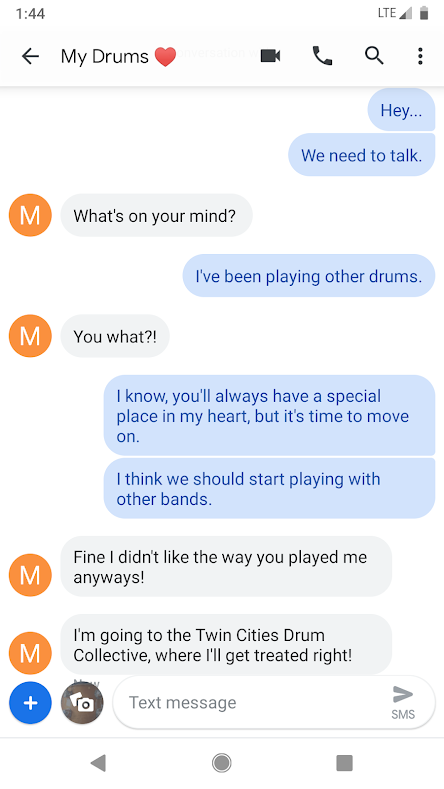 If you are ready to say goodbye to your old gear, then let’s work together to make a new love connection: Nothing is cooler than your drums and cymbals bringing happiness to someone new, and you moving on to something better!